Region: This beetle can be found in southern Canada and the eastern portion of the United States, with a similar species common to the West. Life cycle: The number of generations produced varies with the region. In southern areas, there are up to four generations each year, while in northern regions, one to two generations is common. The adult beetle overwinters in garden rubbish. Physical Description: The adult is slender and about 1/4 inch long. 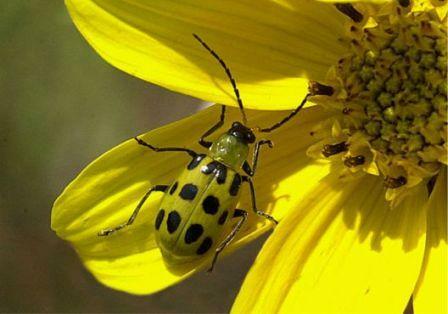 Its wing covers are greenish yellow with a small head and 11 or 12 black spots of the back that vary in size. The oval eggs are yellow and are laid in the soil at the base of plants. The larva is beige with a brown mark on the last body segment, a brown head and is about 1/2inch long. Feeding characteristics: This beetle not only has as a very large appetite, but it also transmits brown rot among stone fruits and causes Cucumber Wilt. Adult will chew holes in plant leaves, flowers, and fruits, while the larva eats roots and stems of plants in the season. Controls: This beetle has the Tachinid Flies (Celatoriadiabrotica) as an effective predator, along with the Soldier Beetle, Braconid Wasp, and Parasitic Nematodes. For serious problems, use rotenone or pyrethrum. Crop rotation is very effective against the larva, known more commonly as rootworms.